Nothing like sticking crystals on a gadget and charging lots of money for it. Micro Anvika have teamed up with luxury UK department store Harrods to cover a Samsung Galaxy Tab in Crystals. It looks a bit PC World meets Dolly Parton to me, but maybe that’s the point. The Galaxy Tab is the strongest iPad rival to emerge so far: when not covered in crystals it is in the same price bracket at £499 (PC World) and packs most of the same features plus a few extra – all the obvious things the iPad doesn’t do like have a camera, play flash videos and work as a phone. It’s on Android too so has a lot of apps. See our hands-on video here. 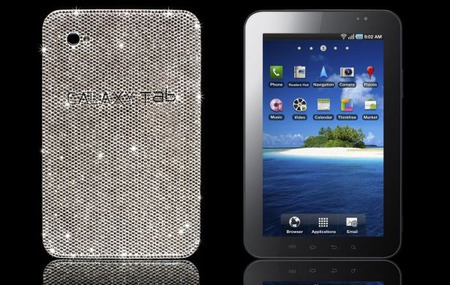 The Crystal Galaxy Tab is available for £2,699, exclusively from Micro Anvika at Harrods. Custom designs can be commissioned through Micro Anvika at Harrods.